Rinse and dry pear and arugula. Set arugula aside. Thinly slice red pear vertically and set aside. Bring a medium pan to low heat and toast pecans (stirring frequently) until golden brown. Remove from heat and set aside. 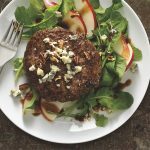 Cook Burger to order (4-5 minutes per side on high heat will usually yield Medium Rare). Prepare Your Plate: Lay bed of arugula and garnish with pear slices, drizzle half of vinaigrette over arugula and pear slices. 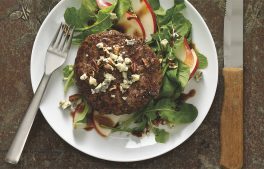 Place your Burger center plate and top with Blue Cheese (to taste). Drizzle remaining vinaigrette over Burger. Garnish with toasted pecans.